For other uses, see Pearl (disambiguation). A pearl is a hard glistening object produced within the soft tissue (specifically the mantle) of a living shelled mollusk or another animal, such as a conulariid. Just like the shell of a mollusk, a pearl is composed of calcium carbonate (mainly aragonite or a mixture of aragonite and calcite) in minute crystalline form, which has been deposited in concentric layers. The ideal pearl is perfectly round and smooth, but many other shapes, known as baroque pearls, can occur. The finest quality natural pearls have been highly valued as gemstones and objects of beauty for many centuries. Because of this, pearl has become a metaphor for something rare, fine, admirable and valuable. The most valuable pearls occur spontaneously in the wild, but are extremely rare. These wild pearls are referred to as natural pearls. Cultured or farmed pearls from pearl oysters and freshwater mussels make up the majority of those currently sold. Imitation pearls are also widely sold in inexpensive jewelry, but the quality of their iridescence is usually very poor and is easily distinguished from that of genuine pearls. Pearls have been harvested and cultivated primarily for use in jewelry, but in the past were also used to adorn clothing. They have also been crushed and used in cosmetics, medicines and paint formulations. Whether wild or cultured, gem-quality pearls are almost always nacreous and iridescent, like the interior of the shell that produces them. However, almost all species of shelled mollusks are capable of producing pearls (technically "calcareous concretions") of lesser shine or less spherical shape. Although these may also be legitimately referred to as "pearls" by gemological labs and also under U.S. Federal Trade Commission rules, and are formed in the same way, most of them have no value except as curiosities. The English word pearl comes from the French perle, originally from the Latin perna meaning leg, after the ham- or mutton leg-shaped bivalve. All shelled mollusks can, by natural processes, produce some kind of "pearl" when an irritating microscopic object becomes trapped within its mantle folds, but the great majority of these "pearls" are not valued as gemstones. Nacreous pearls, the best-known and most commercially significant, are primarily produced by two groups of molluskan bivalves or clams. A nacreous pearl is made from layers of nacre, by the same living process as is used in the secretion of the mother of pearl which lines the shell. Natural (or wild) pearls, formed without human intervention, are very rare. Many hundreds of pearl oysters or mussels must be gathered and opened, and thus killed, to find even one wild pearl; for many centuries, this was the only way pearls were obtained, and why pearls fetched such extraordinary prices in the past. Cultured pearls are formed in pearl farms, using human intervention as well as natural processes. One family of nacreous pearl bivalves – the pearl oyster – lives in the sea, while the other – a very different group of bivalves – lives in freshwater; these are the river mussels such as the freshwater pearl mussel. Saltwater pearls can grow in several species of marine pearl oysters in the family Pteriidae. Freshwater pearls grow within certain (but by no means all) species of freshwater mussels in the order Unionida, the families Unionidae and Margaritiferidae. The unique luster of pearls depends upon the reflection, refraction, and diffraction of light from the translucent layers. The thinner and more numerous the layers in the pearl, the finer the luster. The iridescence that pearls display is caused by the overlapping of successive layers, which breaks up light falling on the surface. In addition, pearls (especially cultured freshwater pearls) can be dyed yellow, green, blue, brown, pink, purple, or black. The very best pearls have a metallic mirror-like luster. Because pearls are made primarily of calcium carbonate, they can be dissolved in vinegar. Calcium carbonate is susceptible to even a weak acid solution because the crystals react with the acetic acid in the vinegar to form calcium acetate and carbon dioxide. Freshwater pearls form in various species of freshwater mussels, family Unionidae, which live in lakes, rivers, ponds and other bodies of fresh water. These freshwater pearl mussels occur not only in hotter climates, but also in colder more temperate areas such as Scotland (where they are protected under law). Most freshwater cultured pearls sold today come from China. Pearls are formed inside the shell of certain mollusks as a defense mechanism against a potentially threatening irritant such as a parasite inside the shell, or an attack from outside that injures the mantle tissue. The mollusk creates a pearl sac to seal off the irritation. Pearls are thus the result of an immune response analogous in the human body to the capture of an antigen by a phagocyte (phagocytosis). The mollusk's mantle (protective membrane) deposits layers of calcium carbonate (CaCO3) in the form of the mineral aragonite or a mixture of aragonite and calcite (polymorphs with the same chemical formula, but different crystal structures) held together by an organic horn-like compound called conchiolin. The combination of aragonite and conchiolin is called nacre, which makes up mother-of-pearl. The commonly held belief that a grain of sand acts as the irritant is in fact rarely the case. Typical stimuli include organic material, parasites, or even damage that displaces mantle tissue to another part of the mollusk's body. These small particles or organisms gain entry when the shell valves are open for feeding or respiration. In cultured pearls, the irritant is typically an introduced piece of the mantle epithelium, with or without a spherical bead (beaded or beadless cultured pearls). Typically, the build-up of a natural pearl consists of a brown central zone formed by columnar calcium carbonate (usually calcite, sometimes columnar aragonite) and a yellowish to white outer zone consisting of nacre (tabular aragonite). In a pearl cross-section such as the diagram, these two different materials can be seen. The presence of columnar calcium carbonate rich in organic material indicates juvenile mantle tissue that formed during the early stage of pearl development. Displaced living cells with a well-defined task may continue to perform their function in their new location, often resulting in a cyst. Such displacement may occur via an injury. The fragile rim of the shell is exposed and is prone to damage and injury. Crabs, other predators and parasites such as worm larvae may produce traumatic attacks and cause injuries in which some external mantle tissue cells are disconnected from their layer. Embedded in the conjunctive tissue of the mantle, these cells may survive and form a small pocket in which they continue to secrete calcium carbonate, their natural product. The pocket is called a pearl sac, and grows with time by cell division. The juvenile mantle tissue cells, according to their stage of growth, secrete columnar calcium carbonate from pearl sac's inner surface. In time, the pearl sac's external mantle cells proceed to the formation of tabular aragonite. When the transition to nacre secretion occurs, the brown pebble becomes covered with a nacreous coating. During this process, the pearl sac seems to travel into the shell; however, the sac actually stays in its original relative position the mantle tissue while the shell itself grows. After a couple of years, a pearl forms and the shell may be found by a lucky pearl fisher. Cultured pearls can be distinguished from natural pearls by X-ray examination. Nucleated cultured pearls are often 'preformed' as they tend to follow the shape of the implanted shell bead nucleus. After a bead is inserted into the oyster, it secretes a few layers of nacre around the bead; the resulting cultured pearl can then be harvested in as few as twelve to eighteen months. Some imitation pearls (also called shell pearls) are simply made of mother-of-pearl, coral or conch shell, while others are made from glass and are coated with a solution containing fish scales called essence d'Orient. Although imitation pearls look the part, they do not have the same weight or smoothness as real pearls, and their luster will also dim greatly. A well-equipped gem testing laboratory can distinguish natural pearls from cultured pearls by using gemological X-ray equipment to examine the center of a pearl. With X-rays it is possible to see the growth rings of the pearl, where the layers of calcium carbonate are separated by thin layers of conchiolin. The differentiation of natural pearls from non-beaded cultured pearls can be very difficult without the use of this X-ray technique. Pearl tiara of Empress Eugénie (1853) featuring 212 natural pearls, Louvre, Paris. The introduction and advance of the cultured pearl hit the pearl industry hard. Pearl dealers publicly disputed the authenticity of these new cultured products, and left many consumers uneasy and confused about their much lower prices. Essentially, the controversy damaged the images of both natural and cultured pearls. By the 1950s, when a significant number of women in developed countries could afford their own cultured pearl necklace, natural pearls were reduced to a small, exclusive niche in the pearl industry. Previously, natural pearls were found in many parts of the world. Present day natural pearling is confined mostly to seas off Bahrain. Australia also has one of the world's last remaining fleets of pearl diving ships. Australian pearl divers dive for south sea pearl oysters to be used in the cultured south sea pearl industry. The catch of pearl oysters is similar to the numbers of oysters taken during the natural pearl days. Hence significant numbers of natural pearls are still found in the Australian Indian Ocean waters from wild oysters. X-ray examination is required to positively verify natural pearls found today. A blister pearl, a half-sphere, formed flush against the shell of the pearl oyster. Keshi pearls, although they often occur by chance, are not considered natural. They are a byproduct of the culturing process, and hence do not happen without human intervention. They are quite small, typically only a few millimeters. Keshi pearls are produced by many different types of marine mollusks and freshwater mussels in China. Keshi pearls are actually a mistake in the cultured pearl seeding process. In seeding the cultured pearl, a piece of mantle muscle from a sacrificed oyster is placed with a bead of mother of pearl within the oyster. If the piece of mantle should slip off the bead, a pearl forms of baroque shape about the mantle piece which is entirely nacre. Therefore, a Keshi pearl could be considered superior to cultured pearls with a mother of pearl bead center. In the cultured pearl industry, the resources used to create a mistaken all nacre baroque pearl is a drain on the production of round cultured pearls. Therefore, they are trying to improve culturing technique so that keshi pearls do not occur. All nacre pearls may one day be limited to natural found pearls. Today many "keshi" pearls are actually intentional, with post-harvest shells returned to the water to regenerate a pearl in the existing pearl sac. Tahitian pearls, frequently referred to as black pearls, are highly valued because of their rarity; the culturing process for them dictates a smaller volume output and they can never be mass-produced because, in common with most sea pearls, the oyster can only be nucleated with one pearl at a time, while freshwater mussels are capable of multiple pearl implants. Before the days of cultured pearls, black pearls were rare and highly valued for the simple reason that white pearl oysters rarely produced naturally black pearls, and black pearl oysters rarely produced any natural pearls at all. Since the development of pearl culture technology, the black pearl oysters Pinctada margaritifera found in Tahiti and many other Pacific islands including the Cook Islands and Fiji are being extensively used for producing cultured pearls. The rarity of the black cultured pearl is now a "comparative" issue. The black cultured pearl is rare when compared to Chinese freshwater cultured pearls, and Japanese and Chinese akoya cultured pearls, and is more valuable than these pearls. However, it is more abundant than the South Sea pearl, which is more valuable than the black cultured pearl. 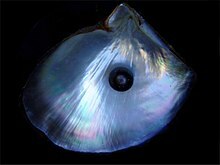 This is simply because the black pearl oyster Pinctada margaritifera is far more abundant than the elusive, rare, and larger south sea pearl oyster Pinctada maxima, which cannot be found in lagoons, but which must be dived for in a rare number of deep ocean habitats or grown in hatcheries. Black pearls are very rarely black: they are usually shades of green, purple, aubergine, blue, grey, silver or peacock (a mix of several shades, like a peacock's feather). Black cultured pearls from the black pearl oyster – Pinctada margaritifera – are not South Sea pearls, although they are often mistakenly described as black South Sea pearls. In the absence of an official definition for the pearl from the black oyster, these pearls are usually referred to as "black pearls". The correct definition of a South Sea pearl – as described by CIBJO and GIA – is a pearl produced by the Pinctada maxima pearl oyster. South Sea pearls are the color of their host Pinctada maxima oyster – and can be white, silver, pink, gold, cream, and any combination of these basic colors, including overtones of the various colors of the rainbow displayed in the pearl nacre of the oyster shell itself. South Sea pearls are the largest and rarest of the cultured pearls – making them the most valuable. Prized for their exquisitely beautiful 'orient' or lustre, South Sea pearls are now farmed in various parts of the world where the Pinctada maxima oysters can be found, with the finest South Sea pearls being produced by Paspaley along the remote coastline of North-Western Australia. White and silver colored South Sea pearls tend to come from the Broome area of Australia, while golden colored ones are more prevalent in the Philippines and Indonesia. A farm in the Gulf of California, Mexico, is culturing pearls from the black lipped Pinctada mazatlanica oysters and the rainbow lipped Pteria sterna oysters. Also called Concha Nácar, the pearls from these rainbow lipped oysters fluoresce red under ultraviolet light. Biologically speaking, under the right set of circumstances, almost any shelled mollusk can produce some kind of pearl. However, most of these molluskan pearls have no luster or iridescence. The great majority of mollusk species produce pearls which are not attractive, and are sometimes not even very durable, such that they usually have no value at all, except perhaps to a scientist or collector, or as a curiosity. These objects used to be referred to as "calcareous concretions" by some gemologists, even though a malacologist would still consider them to be pearls. Valueless pearls of this type are sometimes found in edible mussels, edible oysters, escargot snails, and so on. The GIA and CIBJO now simply use the term 'pearl' (or, where appropriate, the more descriptive term 'non-nacreous pearl') when referring to such items and, under Federal Trade Commission rules, various mollusk pearls may be referred to as 'pearls', without qualification. A few species produce pearls that can be of interest as gemstones. These species include the bailer shell Melo, the giant clam Tridacna, various scallop species, Pen shells Pinna, and the Haliotis iris species of abalone. Pearls of abalone, or paua, are mabe pearls, or blister pearls, unique to New Zealand waters and are commonly referred to as 'blue pearls'. They are admired for their incredible luster and naturally bright vibrant colors that are often compared to opal. Another example is the conch pearl (sometimes referred to simply as the 'pink pearl'), which is found very rarely growing between the mantle and the shell of the queen conch or pink conch, Strombus gigas, a large sea snail or marine gastropod from the Caribbean Sea. These pearls, which are often pink in color, are a by-product of the conch fishing industry, and the best of them display a shimmering optical effect related to chatoyance known as 'flame structure'. Somewhat similar gastropod pearls, this time more orange in hue, are (again very rarely) found in the horse conch Triplofusus papillosus. The second largest pearl known was found in the Philippines in 1934 and is known as the Pearl of Lao Tzu. It is a naturally occurring, non-nacreous, calcareous concretion (pearl) from a giant clam. Because it did not grow in a pearl oyster it is not pearly; instead the surface is glossy like porcelain. Other pearls from giant clams are known to exist, but this is a particularly large one weighing 14 lb (6.4 kg). The largest known pearl (also from a giant clam) is the Pearl of Puerto, also found in the Philippines by a fisherman from Puerto Princesa, Palawan Island. The enormous pearl is 30 cm wide (1 ft), 67 cm long (2.2 ft) and weighs 75 lb (34 kg). The ancient chronicle Mahavamsa mentions the thriving pearl industry in the port of Oruwella in the Gulf of Mannar in Sri Lanka. It also records that eight varieties of pearls accompanied Prince Vijaya's embassy to the Pandyan king as well as king Devanampiya Tissa's embassy to Emperor Ashoka. Pliny the Elder (23–79AD) praised the pearl fishery of the Gulf as most productive in the world. For thousands of years, seawater pearls were retrieved by divers in the Indian Ocean in areas such as the Persian Gulf, the Red Sea and the Gulf of Mannar. Evidence also suggest a prehistoric origin to pearl diving in these regions. Starting in the Han Dynasty (206 BC–220 AD), the Chinese hunted extensively for seawater pearls in the South China Sea. 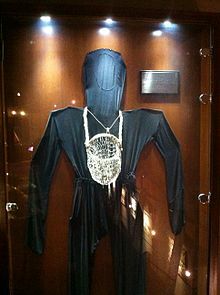 Tanka pearl divers of twelfth century China attached ropes to their waists in order to be safely brought back up to the surface. When Spanish conquistadors arrived in the Western Hemisphere, they discovered that around the islands of Cubagua and Margarita, some 200 km north of the Venezuelan coast, was an extensive pearl bed (a bed of pearl oysters). 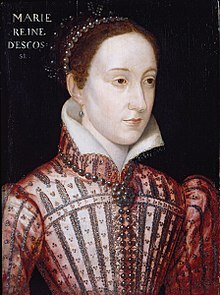 One discovered and named pearl, La Peregrina pearl, was offered to Philip II of Spain and then gifted to his wife Mary I of England. According to Garcilasso de la Vega, who says that he saw La Peregrina at Seville in 1607, this was found at Panama in 1560 by a slave worker who was rewarded with his liberty, and his owner with the office of alcalde of Panama. Margarita pearls are extremely difficult to find today and are known for their unique yellowish color. The most famous Margarita necklace that anyone can see today is the one that then Venezuelan President Romulo Betancourt gave to Jacqueline Kennedy when she and her husband, President John F. Kennedy paid an official visit to Venezuela. Before the beginning of the 20th century, pearl hunting was the most common way of harvesting pearls. Divers manually pulled oysters from ocean floors and river bottoms and checked them individually for pearls. Not all mussels and oysters produce pearls. In a haul of three tons, only three or four oysters will produce perfect pearls. Pearls were one of the attractions which drew Julius Caesar to Britain. They are, for the most part, freshwater pearls from mussels. Pearling was banned in the U.K. in 1998 due to the endangered status of river mussels. Discovery and publicity about the sale for a substantial sum of the Abernethy pearl in the River Tay had resulted in heavy exploitation of mussel colonies during the 1970s and 80s by weekend warriors. When it was permitted it was carried on mainly by Scottish Travellers who found pearls varied from river to river with the River Oykel in the Highlands being noted for the finest rose-pink pearls. There are two firms in Scotland that are licensed to sell pre-1998 freshwater pearls. 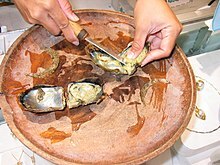 A pearl being extracted from an akoya pearl oyster. Today, the cultured pearls on the market can be divided into two categories. The first category covers the beaded cultured pearls, including akoya, South Sea and Tahiti. These pearls are gonad grown, and usually one pearl is grown at a time. This limits the number of pearls at a harvest period. The pearls are usually harvested after one year for akoya, 2–4 years for Tahitian and South Sea, and 2–7 years for freshwater. This perliculture process was first developed by the British biologist William Saville-Kent who passed the information along to Tatsuhei Mise and Tokichi Nishikawa from Japan. The second category includes the non-beaded freshwater cultured pearls, like the Biwa or Chinese pearls. As they grow in the mantle, where on each wing up to 25 grafts can be implanted, these pearls are much more frequent and saturate the market completely. An impressive improvement in quality has taken place in the last ten years when the former rice-grain-shaped pebbles are compared with the near round pearls of today. In the last two years large near perfect round bead nucleated pearls up to 15mm in diameter have been produced with metallic luster. The nucleus bead in a beaded cultured pearl is generally a polished sphere made from freshwater mussel shell. Along with a small piece of mantle tissue from another mollusk (donor shell) to serve as a catalyst for the pearl sac, it is surgically implanted into the gonad (reproductive organ) of a saltwater mollusk. In freshwater perliculture, only the piece of tissue is used in most cases, and is inserted into the fleshy mantle of the host mussel. South Sea and Tahitian pearl oysters, also known as Pinctada maxima and Pinctada margaritifera, which survive the subsequent surgery to remove the finished pearl, are often implanted with a new, larger beads as part of the same procedure and then returned to the water for another 2–3 years of growth. Despite the common misperception, Mikimoto did not discover the process of pearl culture. 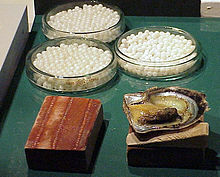 The accepted process of pearl culture was developed by the British Biologist William Saville-Kent in Australia and brought to Japan by Tokichi Nishikawa and Tatsuhei Mise. Nishikawa was granted the patent in 1916, and married the daughter of Mikimoto. Mikimoto was able to use Nishikawa's technology. After the patent was granted in 1916, the technology was immediately commercially applied to akoya pearl oysters in Japan in 1916. Mise's brother was the first to produce a commercial crop of pearls in the akoya oyster. Mitsubishi's Baron Iwasaki immediately applied the technology to the south sea pearl oyster in 1917 in the Philippines, and later in Buton, and Palau. Mitsubishi was the first to produce a cultured south sea pearl – although it was not until 1928 that the first small commercial crop of pearls was successfully produced. The original Japanese cultured pearls, known as akoya pearls, are produced by a species of small pearl oyster, Pinctada fucata martensii, which is no bigger than 6 to 8 cm (2.4 to 3.1 in) in size, hence akoya pearls larger than 10 mm in diameter are extremely rare and highly priced. Today, a hybrid mollusk is used in both Japan and China in the production of akoya pearls. Cultured Pearls were sold in cans for the export market. These were packed in Japan by the I.C.P. Canning Factory (International Pearl Company L.T.D.) in Nagasaki Pref. Japan. Mitsubishi commenced pearl culture with the South Sea pearl oyster in 1916, as soon as the technology patent was commercialized. By 1931 this project was showing signs of success, but was upset by the death of Tatsuhei Mise. 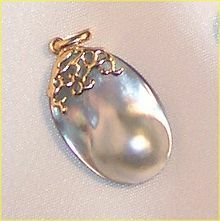 Although the project was recommenced after Tatsuhei's death, the project was discontinued at the beginning of WWII before significant productions of pearls were achieved. After WWII, new south sea pearl projects were commenced in the early 1950s at Kuri Bay and Port Essington in Australia, and Burma. Japanese companies were involved in all projects using technicians from the original Mitsubishi South Sea pre-war projects. Kuri Bay is now the location of one of the largest and most well-known pearl farms owned by Paspaley, the biggest producer of South Sea pearls in the world. In 2010, China overtook Japan in akoya pearl production. Japan has all but ceased its production of akoya pearls smaller than 8 mm. Japan maintains its status as a pearl processing center, however, and imports the majority of Chinese akoya pearl production. These pearls are then processed (often simply matched and sorted), relabeled as product of Japan, and exported. In the past two decades, cultured pearls have been produced using larger oysters in the south Pacific and Indian Ocean. The largest pearl oyster is the Pinctada maxima, which is roughly the size of a dinner plate. South Sea pearls are characterized by their large size and warm luster. Sizes up to 14 mm in diameter are not uncommon. In 2013, Indonesia Pearl supplied 43 percent of South Sea Pearls international market. The other significant producers are Australia, Philippines, Myanmar and Malaysia. In 1914, pearl farmers began growing cultured freshwater pearls using the pearl mussels native to Lake Biwa. This lake, the largest and most ancient in Japan, lies near the city of Kyoto. The extensive and successful use of the Biwa Pearl Mussel is reflected in the name Biwa pearls, a phrase which was at one time nearly synonymous with freshwater pearls in general. Since the time of peak production in 1971, when Biwa pearl farmers produced six tons of cultured pearls, pollution has caused the virtual extinction of the industry. Japanese pearl farmers recently[when?] cultured a hybrid pearl mussel – a cross between Biwa Pearl Mussels and a closely related species from China, Hyriopsis cumingi, in Lake Kasumigaura. This industry has also nearly ceased production, due to pollution. Currently, the Belpearl company based out of Kobe, Japan continues to purchase the remaining Kasumiga-ura pearls. Led by pearl pioneer John Latendresse and his wife Chessy, the United States began farming cultured freshwater pearls in the mid-1960s. National Geographic magazine introduced the American cultured pearl as a commercial product in their August 1985 issue. The Tennessee pearl farm has emerged as a tourist destination in recent years, but commercial production of freshwater pearls has ceased. For many cultured pearl dealers and wholesalers, the preferred weight measure used for loose pearls and pearl strands is the momme. Momme is a weight measure used by the Japanese for centuries. Today, momme weight is still the standard unit of measure used by most pearl dealers to communicate with pearl producers and wholesalers. One momme corresponds to 1/1000 kan. Reluctant to give up tradition, the Japanese government formalized the kan measure in 1891 as being exactly 3.75 kilograms or 8.28 pounds. Hence, 1 momme = 3.75 grams or 3750 milligrams. In the United States, during the 19th and 20th centuries, through trade with Japan in silk cloth the momme became a unit indicating the quality of silk cloth. Though millimeter size range is typically the first factor in determining a cultured pearl necklace's value, the momme weight of pearl necklace will allow the buyer to quickly determine if the necklace is properly proportioned. This is especially true when comparing the larger south sea and Tahitian pearl necklaces. The value of the pearls in jewelry is determined by a combination of the luster, color, size, lack of surface flaw and symmetry that are appropriate for the type of pearl under consideration. 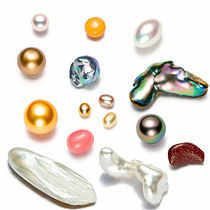 Among those attributes, luster is the most important differentiator of pearl quality according to jewelers. Pearls come in eight basic shapes: round, semi-round, button, drop, pear, oval, baroque, circled and double bouldered. Perfectly round pearls are the rarest and most valuable shape. Semi-rounds are also used in necklaces or in pieces where the shape of the pearl can be disguised to look like it is a perfectly round pearl. Button pearls are like a slightly flattened round pearl and can also make a necklace, but are more often used in single pendants or earrings where the back half of the pearl is covered, making it look like a larger, rounder pearl. Drop and pear shaped pearls are sometimes referred to as teardrop pearls and are most often seen in earrings, pendants, or as a center pearl in a necklace. Baroque pearls have a different appeal; they are often highly irregular with unique and interesting shapes. They are also commonly seen in necklaces. Circled pearls are characterized by concentric ridges, or rings, around the body of the pearl. In general, cultured pearls are less valuable than natural pearls, whereas imitation pearls have almost no value. One way that jewelers can determine whether a pearl is cultured or natural is to have a gemlab perform an X-ray examination of the pearl. If X-rays reveals a nucleus, the pearl is likely a bead-nucleated saltwater pearl. If no nucleus is present, but irregular and small dark inner spots indicating a cavity are visible, combined with concentric rings of organic substance, the pearl is likely a cultured freshwater. Cultured freshwater pearls can often be confused for natural pearls which present as homogeneous pictures which continuously darken toward the surface of the pearl. Natural pearls will often show larger cavities where organic matter has dried out and decomposed. There is a special vocabulary used to describe the length of pearl necklaces. While most other necklaces are simply referred to by their physical measurement, pearl necklaces are named by how low they hang when worn around the neck. A collar, measuring 10 to 13 inches or 25 to 33 cm in length, sits directly against the throat and does not hang down the neck at all; collars are often made up of multiple strands of pearls. Pearl chokers, measuring 14 to 16 inches or 35 to 41 cm in length, nestle just at the base of the neck. A strand called a princess length, measuring 17 to 19 inches or 43 to 48 cm in length, comes down to or just below the collarbone. A matinee length, measuring 20 to 24 inches or 50 to 60 cm in length, falls just above the breasts. An opera length, measuring 28 to 35 inches or 70 to 90 cm in length, will be long enough to reach the breastbone or sternum of the wearer; and longer still, a pearl rope, measuring more than 45 inches or 115 cm in length, is any length that falls down farther than an opera. Necklaces can also be classified as uniform, or graduated. In a uniform strand of pearls, all pearls are classified as the same size, but actually fall in a range. A uniform strand of akoya pearls, for example, will measure within 0.5 mm. So a strand will never be 7 mm, but will be 6.5–7 mm. Freshwater pearls, Tahitian pearls, and South Sea pearls all measure to a full millimeter when considered uniform. A graduated strand of pearls most often has at least 3 mm of differentiation from the ends to the center of the necklace. Popularized in the United States during the 1950s by the GIs bringing strands of cultured akoya pearls home from Japan, a 3.5 momme, 3 mm to 7 mm graduated strand was much more affordable than a uniform strand because most of the pearls were small. Earrings and necklaces can also be classified on the grade of the color of the pearl: saltwater and freshwater pearls come in many different colors. While white, and more recently black, saltwater pearls are by far the most popular, other color tints can be found on pearls from the oceans. Pink, blue, champagne, green, and even purple saltwater pearls can be encountered, but to collect enough of these rare colors to form a complete string of the same size and same shade can take years. The Hindu tradition describes the sacred Nine Pearls which were first documented in the Garuda Purana, one of the books of the Hindu mythology. Ayurveda contains references to pearl powder as a stimulant of digestion and to treat mental ailments. According to Marco Polo, the kings of Malabar wore a necklace of 108 rubies and pearls which was given from one generation of kings to the next. The reason was that every king had to say 108 prayers every morning and every evening. 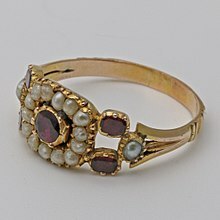 At least until the beginning of the 20th century it was a Hindu custom to present a completely new, undrilled pearl and pierce it during the wedding ceremony. The Pearl, which can be transliterated to "Moti", a type of "Mani" from Sanskrit, is also associated with many Hindu deities, the most famous being the Kaustubha that Lord Vishnu wears on his chest. According to Rebbenu Bachya, the word Yahalom in the verse Exodus 28:18 means "pearl" and was the stone on the Hoshen representing the tribe of Zebulun. 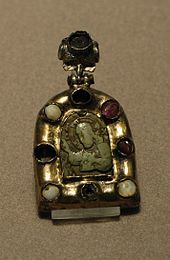 This is generally disputed among scholars, particularly since the word in question in most manuscripts is actually Yasepheh – the word from which jasper derives; scholars think that refers to green jasper (the rarest and most prized form in early times) rather than red jasper (the most common form). Yahalom is usually translated by the Septuagint as an "onyx", but sometimes as "beryl" or as "jasper"; onyx only started being mined after the Septuagint was written, so the Septuagint's term "onyx" probably does not mean onyx – onyx is originally an Assyrian word meaning ring, and so could refer to anything used for making rings. Yahalom is similar to a Hebrew word meaning hit hard, so some people[who?] think that it means diamond. The variation in possibilities of meaning for this sixth stone in the Hoshen is reflected in different translations of the Bible – the King James Version translates the sixth stone as diamond, the New International Version translates it as emerald, and the Vulgate translates it as jaspis – meaning jasper. There is a wide range of views among traditional sources about which tribe the stone refers to. In a Christian New Testament parable (Matthew 13:45–46), Jesus compared the Kingdom of Heaven to a "pearl of great price". "Again, the kingdom of heaven is like unto a merchant man, seeking goodly (fine) pearls: Who, when he had found one pearl of great price, went and sold all that he had, and bought it." The twelve gates of the New Jerusalem are reportedly each made of a single pearl in Revelation 21:21, that is, the Pearly Gates. "And the twelve gates were twelve pearls; every gate was of one pearl: and the streets of the city were pure gold, as if transparent glass." Holy things are compared to pearls in Matthew 7:6: "Do not give dogs what is holy, and do not throw your pearls before pigs, lest they trample them underfoot and turn to attack you." Pearls are also found in numerous references showing the wickedness and pride of a people, as in Revelation 18:16. "And saying, Alas, alas, that great city, that was clothed in fine linen, in purple and scarlet, and decked with gold, and precious stones, and pearls!" 22:23 God will admit those who believe and work righteous deeds, to Gardens beneath which rivers flow: they shall be adorned therein with bracelets of gold and pearls; and their garments there will be of silk. 35:33 Gardens of Eternity will they enter: therein will they be adorned with bracelets of gold and pearls; and their garments there will be of silk. 52:24 Round about them will serve, [devoted] to them, youths [handsome] as pearls well-guarded. The metaphor of a pearl appears in the longer Hymn of the Pearl, a poem respected for its high literary quality, and use of layered theological metaphor, found within one of the texts of Gnosticism. The Pearl of Great Price is a book of scripture in The Church of Jesus Christ of Latter-day Saints (LDS Church) and some other Latter Day Saint denominations. ^ a b c d e Schumann, Walter (2001). Gemstones of the World. Robert Hale. p. 230. ISBN 978-0-7198-0301-7. ^ Lazzarelli, Herve Nicolas (2010). Blue Chart Gem Identification. p. 8. Archived from the original on October 6, 2017. ^ "Pearl". Gemdat.org. Archived from the original on April 4, 2017. Retrieved April 3, 2017. ^ a b "Guides for the Jewelry, Precious Metals, and Pewter Industries". Ftc.gov. May 30, 1996. Archived from the original on May 28, 2010. Retrieved July 17, 2010. ^ Sima, Petr. (1990). Evolution of Immune Reactions. Taylor & Francis. ISBN 978-0849365935. ^ "Pearl oyster farming and pearl culture". Fao.org. Archived from the original on March 20, 2008. Retrieved May 17, 2013. ^ a b Farn, Alexander E. (2013). Pearls : Natural, Cultured and Imitation. Burlington: Elsevier Science. pp. 90–108. ISBN 9781483162737. ^ Strack, Elisabeth. "Pearls". Ruhle-Diebener-Verlag, 2006, p. 38 ISBN 3981084802. ^ Hanni, H A (June 2006). "Keshi Perlen: Ein Erklarungbedurftiger Begriff (Keshi Pearls: a term in need of explanation)". Zeitschrift der Deutschen Gemmologischen Gesellschaft. DGemG. 55 (1–2): 39–50. ^ Pouvreau, Stéphane; et al. (2000). "Ecophysiological model of growth and reproduction of the black pearl oyster, Pinctada margaritifera: potential applications for pearl farming in French Polynesia". Aquaculture. 186 (1–2): 117–144. doi:10.1016/S0044-8486(99)00373-7. ^ Pinctada maxima Archived August 20, 2017, at the Wayback Machine. MissJoaquim.com Retrieved on 2017-05-31. ^ How To Buy Pearls Archived September 28, 2013, at the Wayback Machine. Nature.berkeley.edu. Retrieved on 2015-10-14. ^ a b Scarratt, Kenneth (2012). "Natural Pearls from Australian Pinctada maxima". Gems & Gemology. 48 (4): 236–261. doi:10.5741/GEMS.48.4.236. Archived from the original on October 16, 2015. ^ "Jewel of the South Sea" (PDF). Archived (PDF) from the original on September 30, 2013. ^ Concha Nacar | The Sea of Cortez Pearl Blog Archived February 25, 2014, at the Wayback Machine. Perlas.com.mx (2010-11-22). Retrieved on 2015-10-14. ^ "CIBJO 'Pearl Book'" (PDF). Archived (PDF) from the original on July 23, 2011. Retrieved July 30, 2010. ^ "GIA 'Gems & Gemology' magazine news archive". Gia.edu. Archived from the original on January 13, 2009. Retrieved July 30, 2010. ^ "Fisherman hands in giant pearl he kept under the bed for 10 years". The Guardian. Archived from the original on August 24, 2016. Retrieved August 25, 2016. ^ Senaveratna, John M (1930). The story of the Sinhalese: From the most ancient times up to the end of "The Mahavasna", or great dynasty; Vijaya to Maha Sena (B.C. 543 to A.D. 302). W.M.A. Wahid. pp. 16–9, 46, 130, 144–8, 161–3, 213. ISBN 9788120612716. Archived from the original on December 20, 2017. ^ Kunz, George F.; Stevenson, Charles (1908). The book of the pearl. New York: The Century Co. p. 2. Archived from the original on May 14, 2016. ^ R. Raghu Prasad and P. V. Ramachandran Nair (1973). "India and the Indian Ocean Fisheries" (PDF). Journal of the Marine Biological Association of India. 15: 1–19. Archived (PDF) from the original on July 18, 2011. ^ Arnold Wright (1999). Twentieth century impressions of Ceylon: its history, people, commerce, industries, and resources. p. 227. ISBN 978-81-206-1335-5. Archived from the original on January 18, 2017. ^ James Hornell (2009). The Indian Pearl Fisheries of the Gulf of Manar and Palk Bay. BiblioBazaar. p. 6. ISBN 978-1-110-87096-7. Archived from the original on January 18, 2017. ^ De Silva, K. M. (1995). Volume 2 of History of Ceylon, History of Ceylon: History of Sri Lanka. Peradeniya: Ceylon University Press. p. 56. ISBN 978-955-589-004-5. OCLC 952216. ^ a b "History of the Discovery and Appreciation of Pearls - the Organic Gem Perfected by Nature". internetstones.com. Archived from the original on December 6, 2015. Retrieved January 31, 2016. ^ a b ROBERT CARTER (2005). "THE HISTORY AND PREHISTORY OF PEARLING IN THE PERSIAN GULF" (PDF). Archived (PDF) from the original on May 13, 2016. Retrieved January 31, 2016. ^ Needham, Joseph (1971). Science and Civilisation in China. Cambridge University Press. p. 672. ISBN 9780521070607. ^ Stott, Rebecca (2004). Oyster. Reaktion Books. p. 192. ISBN 9781861892218. ^ Garcilasso, "Historie des Incas, Rois du Perou," Amsterdam, 1704, Vol. II, P. 352. ^ "It was not only Britain’s mineral resources or her pretty slaves that had persuaded Caesar to make his military move across the Channel that summer: according to his biographer Gaius Suetonius Tranquillus it was something quite different. It was her pearls." Finlay, Victoria. Jewels: A Secret History (Kindle Locations 1264-1267). Random House Publishing Group. Kindle Edition. ^ "Unlike sea pearls, which come from oysters, freshwater pearls come from mussels. And although farmed mussels are common throughout the world, wild colonies are now so endangered that in 1998 pearling was forbidden in the UK river system. Finlay, Victoria. Jewels: A Secret History (Kindle Locations 1289-1290). Random House Publishing Group. Kindle Edition. ^ "The new weekend pearl-fishers were “mostly middle-aged men driving big cars with beer coolers in the back” and they would spend afternoons pulling hundreds of live mussels out of the rivers, opening them, and throwing away the shells, with not a care for conservation or the breeding season. All they cared about was finding another Abernethy pearl. Finlay, Victoria. Jewels: A Secret History (Kindle Locations 1375-1377). Random House Publishing Group. Kindle Edition. ^ "Pearlers were mostly Highland traveling people..." Finlay, Victoria. Jewels: A Secret History (Kindle Location 1296). Random House Publishing Group. Kindle Edition. ^ "Pearls from the Oykel River, northwest of Inverness, for example, are a sweet rose pink, and have always been the most valuable." Finlay, Victoria. Jewels: A Secret History (Kindle Location 1341). Random House Publishing Group. Kindle Edition. ^ Travel more. Create better memories. "Welcome to Kuri Bay Paspaley Pearl Farm". Ytravelblog.com. Archived from the original on September 27, 2013. Retrieved September 26, 2013. ^ "Special Virtues Indonesian South Sea Pearls". Archived from the original on August 20, 2017. ^ "Indonesian Pearls Figures". Archived from the original on August 20, 2017. ^ "Indonesia Pasok 43 Persen Mutiara Dunia". August 13, 2013. Archived from the original on February 21, 2014. ^ Kunz, George F.; Stevenson, Charles (1908). The book of the pearl. New York: The Century Co. p. 412. Archived from the original on May 14, 2016. ^ Kunz, George F.; Stevenson, Charles (1908). The book of the pearl. New York: The Century Co. p. 350. Archived from the original on May 14, 2016. Wikisource has the text of the 1921 Collier's Encyclopedia article Pearl. The History of Pearls. PBS Pearl History Special.